If I had to name my favorite pattern, it would have to be florals! Anybody else here obsessed with colorful flowers? I know I can't be the only one, ha! I try to incorporate florals into my projects whenever I can. There's just something vibrant and refreshing about flowers that I simply love. 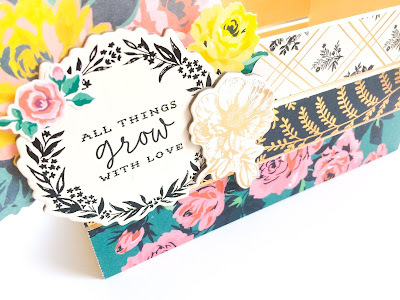 That's one of the reasons I adored the Crate Paper & Maggie Holmes Flourish collection. Flowers galore! 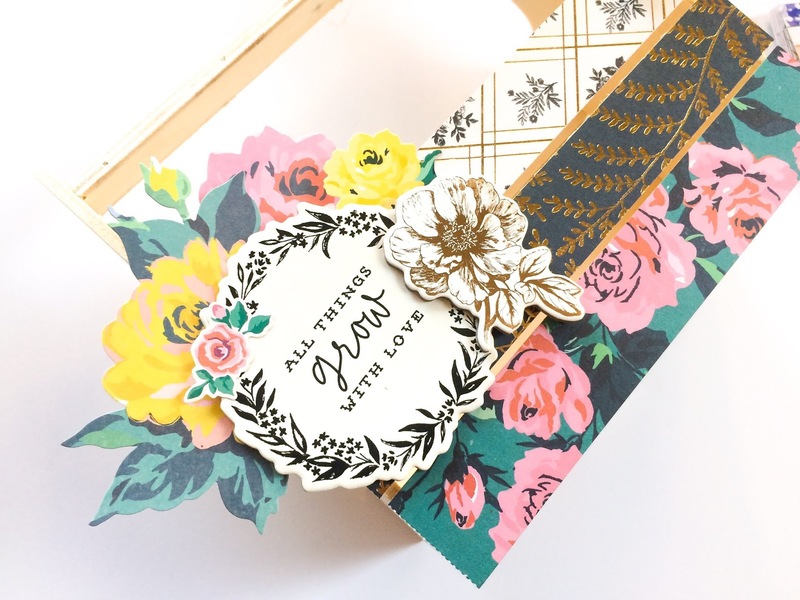 I decided to use this collection to create a pretty floral box decor piece for my desk. I needed a "tool box" of sorts to store away some of my most used scrapbook items while still keeping them handy. Things like adhesive tape, foam dots, my bone folder, hole punch, etc. 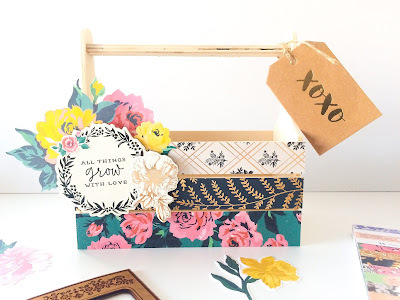 Read on below for the craft tutorial so you can make your own box! Wooden tool box - I got mine from Michael's. They have several different sizes and styles to choose from! I made this beauty in about 30 minutes. Super simple and fast! I started by choosing the patterned papers I wanted to use on my box. My box is a crate style so it has three wooden planks with a little space in between them. The papers from the Flourish 6x8 paper pad fit perfectly length wise! I just trimmed them down height wise to make sure they covered the whole plank. Then, I simply adhered them directly onto the wood using adhesive tape. I used three separate patterned papers, one for each plank. After my paper strips were adhered, I chose the ephemera and stickers I wanted to use. Since it is a floral themed box, I wanted to highlight the large "All Things Grow With Love" chipboard sticker as the main focus. However, I still wanted to add some layering and dimension. So I adhered a couple floral ephemera pieces tucked behind the chipboard sticker. I added one small floral cardstock sticker to the upper left side of the chipboard sticker. And I also adhered another gold floral chipboard sticker on top of the bottom right edge. I placed this embellishment cluster toward the left side of the box. This way my patterned papers would still be visible. 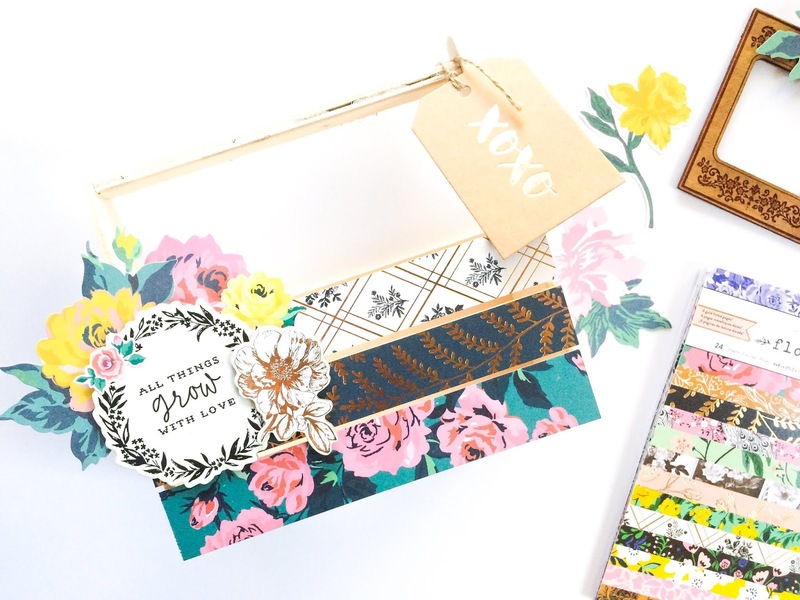 It adds just enough embellishing while still keeping the box overall simple. Lastly, I found a craft paper style tag in my stash that I decided to use. I simply tied it around the right corner of the top handle bar of the box. And with that, my box was complete! I decided to use this box as a little storage "tool box" for some of my scrapbooking tools, but there are so many other creative ways to use a project like this! Whether you decide to make it floral or not, the possibilities are endless. This kind of craft can easily become a pretty, purposeful, and practical item. See some other creative ideas below! Coffee table decor - a place to keep all your remotes! 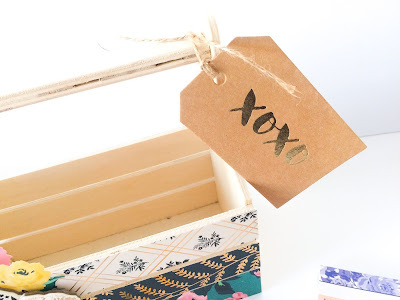 Use simply as cute decor in your home! There are so many creative ways to make this altered tool box practical and useful! No matter what your hobbies are, how you decorate your home, or what you use in your every-day life. Make it functional for you and stay inspired by the creativity behind it! I hope you all enjoyed this simple craft tutorial! Let me know if you decide to give it a try. I can't wait to see what you make! Comment below letting me know what you would use this box for! And be sure to heck out my blog Aspire by Grace for more scrapbooking and craft tutorials.